Late Blight caused by the fungus-like organism, Phytophthora infestans - a very destructive and infectious disease, occurs sporadically in most of New England in most growing seasons. Late Blight outbreaks from 2005 to 2008 developed during late summer/early fall and were the result of inoculum (sporangia) carried on storm systems that originated in southern areas where the disease was active. In 2009, the disease was widespread and developed early. Typically, potato is the main crop affected; in 2009, a strain aggressive on tomato was present on tomato transplants. This new genotype of late blight, US22, caused a disease epidemic throughout the Northeast. First reports of the pathogen were recorded in late June, the earliest incidence of widespread disease ever observed in our region. US22 was detected in tomato plants for sale in garden centers in numerous states by extension specialists. Garden retailers can help prevent the spread of late blight in gardens and on farms and provide customers with the facts about this disease. 1). Tomatoes: Grow tomato plants from seed or purchase starter plants produced locally. Phytophthora infestans does not survive in or on tomato seed (however, it is tuber-borne in potato), so tomato plants started from seed locally (Northeast) would be free of the disease. Potatoes: Purchase certified, disease-free seed potato from a reputable source and ask your supplier about their source of seed and if it was inspected in the field for late blight. Seed potato from the northeast are less likely to carry the disease. 2). Tomato plugs imported from the south may be a potential source of the disease organism. If you must bring transplants from the south, carefully inspect all tomato plugs and teach staff what to look for before accepting shipments and reject any with symptoms of disease. If possible, isolate new plants and inspect them regularly until their disease-free status is confirmed. 3). Start transplant production in a clean greenhouse free from previous crops, pet plants, and weeds. Grow vegetable transplants separately from bedding plants. This prevents cross-infection from ornamental plants (solanaceous flowering crops - petunia) which can harbor Late blight, TSWV (tomato spotted wilt virus), INSV (impatiens necrotic spot virus) and other potential vegetable pathogens. This also makes pesticide treatment easier as many materials registered on ornamentals are not registered for vegetable transplants. 4). Select resistant tomato varieties where available. ‘Mountain Magic’, ‘Legend’, and ‘Plum Regal’ have excellent resistance to Late Blight. ‘Red Pearl’ and ‘Matt’s Wild Cherry’ are small fruited tomatoes with good resistance. Some heirloom tomato varieties have good tolerance to late blight. A few cultivars also have resistance to Early Blight (Alternaria solani, A. tomatophila) and should be considered. 4). Remove solanaceous weeds in and around the greenhouse. Examples include hairy nightshade, bittersweet nightshade, jimson weed, golden henbane, and others. The ornamental plants petunia and calibrachoa are also hosts for late blight. 6). Scout greenhouses regularly for disease . 7). Confirm possible late blight occurrences with the UMass Extension Plant Diagnostic Lab. 8) If Late blight is confirmed, immediately remove and destroy affected plant tissue and promptly inform neighbors that grow susceptible crops. 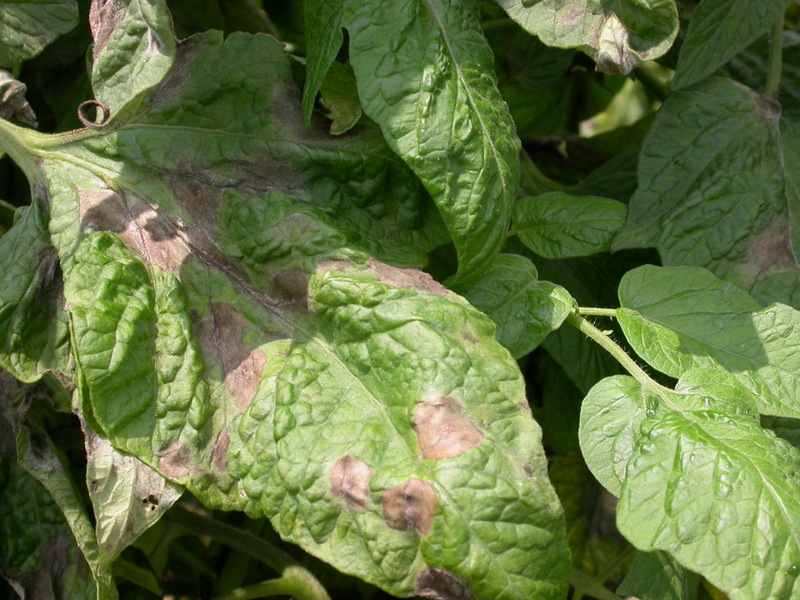 Late blight is a community disease due to its potential to spread rapidly. 9). Protect remaining healthy plants with preventive fungicide applications. See www.nevegetable.org/ for a list of registered products. Continue scouting on a regular basis as late blight is difficult to manage once it has been established. Potatoes that freeze or fully decompose will not carry the pathogen over winter. Tomatoes will not carry late blight over the winter, because freezing kills the whole plant. Tomato seed, even fromf ruit that was infected with late blight, will not carry the pathogen, so no need to worry about the tomatoes left behind in the garden or compost pile. Certain perennial weeds can become infected with late blight, but non of their above-ground tinnues live through the winter. Late blight will not survive on tomato stakes and cages. The biggest threat for overwintered disease in New England is on potatoes. In the spring, advise home gardeners to inspect last year's potato plot and any compost or cull piles for volunteer potato plants that might come up. If they find potato plants, pull them out and put them in the trash or destroy them. If tubers were infected and survive, then the late blight could grow upward from the tuber, infecting the stem and producing spores when weather conditions are favorable. These spores could then disperse to other tomato and potato plants.